In my observations of conference realignment over the past several years, I’ve actually believed that the various oft-maligned leaders of the Big East have often received a bad rap. The frequent criticism that the basketball side ran the Big East rang hollow to me since having great basketball while improving football are not mutually exclusive, meaning that it made no sense to dilute what was legitimately an elite basketball conference just to add mediocre football bodies. At the same time, there was never going to be a “proactive” move that would have prevented any Big East member from accepting an invite from the ACC, Big 12 or Big Ten. Adding the likes of Houston, SMU, East Carolina, Memphis and Tulane earlier was never going to change the minds of Syracuse, Pitt, West Virginia, Notre Dame, Louisville and Rutgers when they got the opportunity to find different homes. No one can really blame any Big East leader for those schools leaving. The last two defections (Rutgers to the Big Ten and Louisville to the ACC), though, should not have caused an exodus that has seen the non-football “Catholic 7” group (Georgetown, Villanova, St. John’s, Seton Hall, Providence, DePaul and Marquette) leave the league that several of them founded and Boise State decide to never even join as a football-only member (with San Diego State likely leaving right behind them). Just because UConn and Cincinnati are doing everything that they can to leave the Big East didn’t have to mean that this league needed to split apart entirely. Big East commissioner Mike Aresco, who came into the office this past summer with great fanfare and accolades from college sports industry veterans, has made a number of missteps that can’t be simply blamed on Rutgers and Louisville leaving. Back in the heady days of October, the spin coming out of the Big East was that their new TV deal would be well in excess of $10 million per all-sports school and could even approach ACC-level figures. Aresco, being a long-time TV industry executive with CBS Sports and ESPN, seemed to have some street cred on the issue. However, the problem with all of the Big East valuations was that they were based on external broad-based market factors, such as new ESPN competitors (e.g. NBC Sports Network, Fox Sports One, etc.) needing the magic word of “inventory” and the overall rise in TV sports rights, as opposed to anything at all with the intrinsic value of the Big East itself. The Big East tricked themselves (and many of their fans) into believing that they could turn down whatever ESPN was offering during an exclusive negotiating window period that ended on October 31st simply because they were selling a new TV contract in a rising market. Even if Rutgers and Louisville had never left the Big East (as those defections occurred after the ESPN window expired), it was playing with fire. There was never a guarantee that notoriously cheap Comcast was going to step up with a large offer on behalf of NBC Sports Network while Fox seemed to be more focused on other college conferences. This isn’t just 20/20 hindsight from my viewpoint – the Big East got cocky about their TV valuation back in the fall and set themselves up to get burned on a number of levels irrespective of the actions of the Big Ten and ACC. That cockiness about the potential TV deal led the Big East down a path where they mistakenly thought that they could convince BYU to join the league as a football-only member. As I’ve stated several times before, BYU’s decision to become an independent was much more about obtaining exposure in and of itself with its ESPN contract and the leveraging of BYUtv than TV money itself. However, reports out of the Big East repeatedly indicated that they wanted to keep going after BYU in a misguided belief that the conference could throw enough money to get the Cougars to bite. This waste of time with respect to BYU prevented the Big East from moving on to different football-only alternatives for its proposed western flank, such as concentrating more on Air Force or going after other Mountain West members. By the time that it was clear that the TV deal that the Big East was holding out for would never materialize, it was too late to get even Fresno State or UNLV (much less BYU). 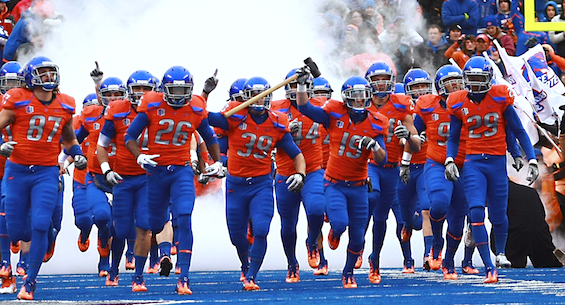 Without further western members willing to come to the Big East, that forced Boise State to reevaluate its own status and ultimately decide to remain in the Mountain West. Whether or not the Big East should have offered Boise State some favorable TV deal terms in the same vein as the Mountain West did (where Boise State’s home games will be sold as a separate TV deal with financial bonuses to schools for national TV appearances) is irrelevant here. It would never have come to this if the Big East hadn’t overvalued its TV prospects three months ago. Meanwhile, the Catholic 7 had been witnessing the league that many of them founded start turn completely into Conference USA 2.0 over the past several years. What kept them around up until last month was the prospect of a TV deal driven by the bubble in college football. However, what the Catholic 7 figured out (and something that every single college sports fan that follows conference realignment should take note of) is that football in and of itself is not valuable. Instead, what’s valuable is having the right football teams, and the Big East no longer had them. Thus, hitching their wagon to schools simply because they played football no longer provided extra value to the Catholic 7, which meant there also wasn’t any point to being in an unstable hybrid that was getting picked apart due to football-focused conference realignment. Receiving roughly the same TV money in a league that the Catholic 7 could control without worrying about football while also being an aggressor within its sphere of basketball-focused conference realignment (instead of being a victim) became much more appealing. Of course, that TV calculation by the Catholic 7 would have never happened if the Big East had taken the ESPN offer this past fall since the league would have locked in an amount for the basketball schools that wouldn’t have made it worth it to consider splitting off. At this point, the Big East mainly has to ensure that schools such as Houston and SMU don’t end up heading over to the Mountain West along with Boise State and presumably San Diego State, as well. Now, I personally don’t believe that the Big East will lose anyone else to the MWC (the Big East still seems to be a better value proposition for the Texas-based schools), but perception of who is weak or strong can change pretty quickly in conference realignment. It’s one thing for the Big East to be losing head-to-head battles with the Big Ten and ACC, yet it’s an entirely different matter when the MWC seems to have more momentum. Ultimately, the decisions of Boise State and the Catholic 7 indicate that the new Big East TV valuation wasn’t going to be much of an increase (if there was an increase at all) over the Mountain West’s current fairly pedestrian deal and what the Catholic schools could receive in basketball TV money on their own. All of that shows that Aresco turning down ESPN’s offer that would have surely been enough to keep Boise State and the Catholic 7 in the fold was a monumental error. The Big East wanted to believe that it could still be in the power conference conversation or even argue that it was a stronger football league than the ACC. However, they got put back into place quickly by the conference realignment gods with a major assist from the hubris of the Big East leadership.